by having them near you, in your room or if you wear them as a pendant, ring or necklace etc.. The first time I came in contact with crystals was in 1999. Since then crystals are a very important part in my life and also in my work. There are many ways of using crystals; you can carry them near you, build a crystal grid in a room or in your garden, put them near food or water and plants. They can be used for massages, energy work and in meditations and a lot more. Crystals have healing properties and give off their good energy to comfort you. They also absorb energies that are no longer needed. It is just like with humans, wherever you were born and raised and taught had an influence on who you have become. Of course your own personality has a strong influence on your life as well. Wherever crystals have grown has influenced the mineralisation and the beautiful earth energy and the surroundings have made them who they are. Each one has a ‘personality’ and when you see or touch crystals; you are only attracted to the ones that are on your wavelength at the time. I treat my crystals like friends, living beings and they really appreciate that. Just like any living being crystals like to be treated with respect and appreciation. They will give you lots of good energy in return. them regularly, they are always working with you. It is best to cleanse crystals after using them for a while. One way would be to put them in the garden, a shady place would assure that they don’t fade; on the windowsill overnight especially at full moon will give them a good charge. You can use a bowl of dried rice or a bowl of salt to put the crystals into for clearing energies, just dispose of the rice or salt after using it to clear unwanted energies. Some crystals like to be rinsed under cold water, make sure you look up how to clean them, since not all crystals can take water or sunlight. Placing crystals near an Amethyst will recharge them beautifully. 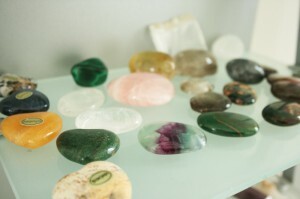 Crystals are part of my work with Healing Facilitation, Massages and I often use crystals for meditations. I can assure you all treatments will make you feel very relaxed and balanced.